We buy cell phones, and in fact we are probably the biggest cell phone buyer in Mesa, Arizona, so if you are ready to move on to the latest and greatest upgrade, bring your old model in to us, and receive the biggest possible payment in return. Cell phones can be very expensive these days, with all the tremendous capabilities they have. For a great many people, the telephone itself is only a tiny percentage of the functional usability they get from their cell phones, and they are really more of a complex computer sitting in your pocket or your purse, as well as an extremely mobile connection to the Internet. For all this, as well as the necessary accessories, you are asked to pay a small fortune when you purchase one from your local device store. We understand all this, and that’s why we give you the very highest price we can when you’re ready to upgrade to the newest model, and you need to get the maximum payout for your old cell phone. What Phones Do You Buy as a Cell Phone Buyer? 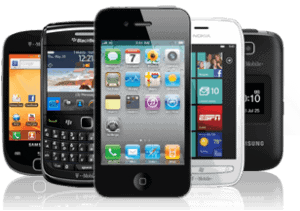 We accept all kinds of cell phones including Samsung, LG, Motorola, HTC, Sony, blackberry, Verizon, T-Mobile, Nokia, ZTE, Droid, and iOS. Even if your phone has a cracked case, or has suffered some type of superficial damage, it will still probably have value so we can work with you on either arranging a loan, or buying it from you outright. When you do bring your phone into us, make sure to bring in all the original accessories, because that will increase its value to us, and it will have greater resale value to someone else who’s in the market to buy a phone. Our in-house as experts will evaluate the working condition of your cell phone, as well as its original list price, and then make you the first possible offer for your phone. What Else Can be Done for Cell Phones? There are of course, other options available to you for the financing of your new phone purchase, but all things considered, the best available option open to you just might be to come see the biggest cell phone buyer in Mesa, Arizona. If you live anywhere in the surrounding area, for instance in the nearby communities of Scottsdale, Gilbert, Tempe, Chandler, Apache Junction, or even big-city Phoenix, we think it will be worth the drive to make a personal visit to our shop, so you can receive the most amount of money for your used cell phone. Also, it’s not only phones we offer pawn loans on. Check our store for other pawn loans available! If you really love the cell phone you have and are not interested in selling it, but just need to raise some quick cash to cover a short-term financial gap, we can also help you by setting up a pawn arrangement rather than you selling us your phone. We can write a contract with you that would cover a 3-month loan period, while you receive immediate cash for your phone, and then you can make payments for those three months until you have the load paid off. Then you can redeem your phone and once again enjoy full use of it.